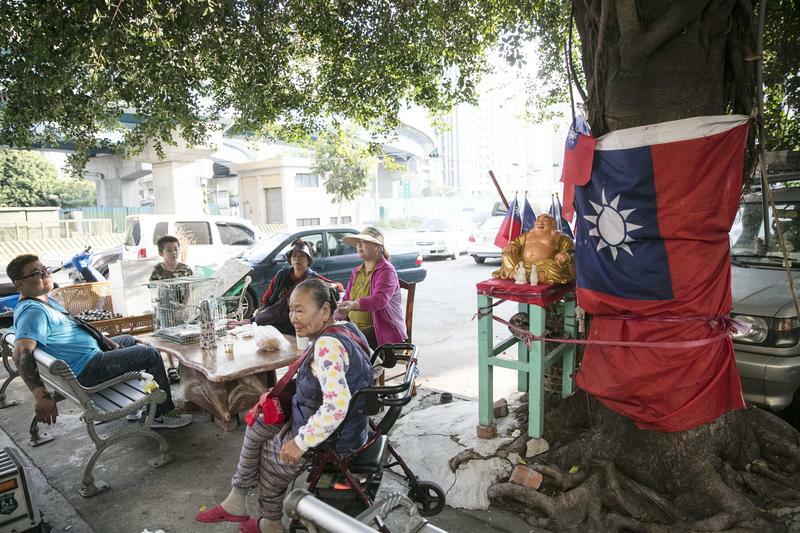 How Kaohsiung Got Swept Up In The "Han Kuo-Yu Wave"
On the eve of Han Kuo-yu's (韓國瑜) election victory, the Reporter went to Kaohsiung to meet with residents on the streets, at election rallies and at military dependents’ villages. We wanted to understand why Han was greeted with such enthusiasm, and what it means for this industrial port city. 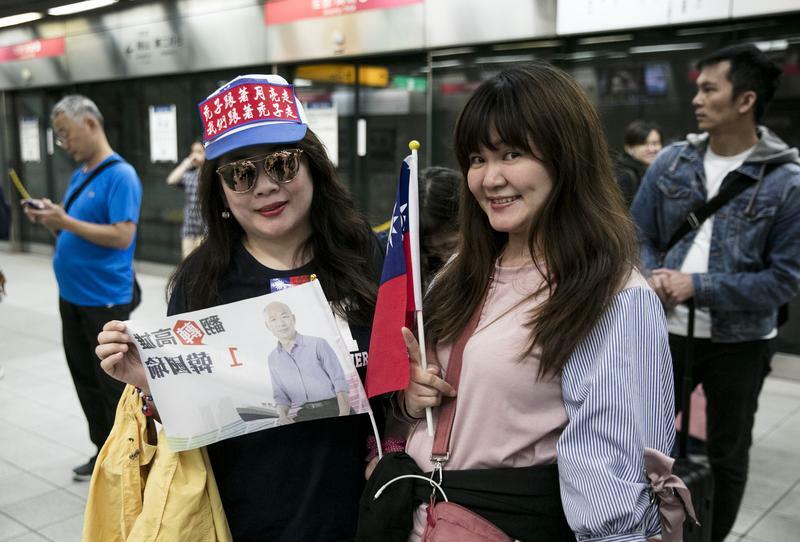 The military dependents' village: "More enthusiastic for Han than even President Ma"
It's the night before voting day, and residents from the Guomao Community in Kaohsiung's Zuoying district are waiting on the streets, with mini Republic of China (ROC) flags in hand. Han Kuo-yu's campaign car will soon make its final swing through the area, and residents are hoping to catch a glimpse of Han himself. As the campaign car winds its way through the narrow alleys of Guomao's public housing projects, the car's loudspeakers fill the night air with a song called “Night Attack” (夜襲)— a song that harkens back to Taiwan’s martial law era, when music was composed in service of the state, and celebrated the courage of the ROC's armed forces. In the last Kaohsiung mayoral election, the Democratic Progressive Party (DPP)'s Chen Ju (陳菊) defeated the KMT's Yang Chiu-hsing (楊秋興) by a huge margin. But in Guomao, a community with a reputation for strong KMT support, Yang picked up 73 percent of the vote. This election, Han Kuo-yu's candidacy is garnering far more excitement. Pundits and KMT supporters are calling Han's newfound popularity "hanliu"—the "Han Kuo-yu Wave". Hanliu is also a play on the word "hallyu", a term used to denote the skyrocketing popularity of South Korean pop culture, which just happens to share some of the Chinese characters in Han Kuo-yu's name. As the campaign car passes through, Guomao's borough warden, Han Te-ping (韓得平) says the community hasn't been this passionate about a political candidate in a long time. “The last time we felt this way was during Ma Ying-jeou (馬英九)'s first presidential run in 2008!” he says. "The 700 mini-flags I prepared in the morning have all been snatched up, and even the big flag I had in my office was taken away. The warden's office is totally empty." When Han Kuo-yu came to Kaohsiung to take up the post of the local KMT branch in Kaohsiung, and Han's plan to run in Kaohsiung was only a rumour, no one expected his candidacy would cause such a sensation. "The community used to be even more pro-KMT, but now, more than half of the people in Guomao don't come from a military dependents' village. But this place is still a storehouse for KMT votes, through and through,” says Han Te-ping. Residents of Guomao Community in Kaohsiung's Zuoying District. Photo by Lin You-en. The psychotherapist: "Kaohsiung's feeling of glory is gone"
Chen Feng-wei (陳豐偉) is a doctor, and has observed local politics in Kaohsiung for many years. “Voting for Chen Chi-mai (陳其邁)—the DPP's candidate for Kaohsiung City—is like choosing a train that moves steadily along, in a forward direction. But voting for Han Kuo-yu is like receiving a mystery box,” he says. Chen Feng-wei's decades of experience in medicine has allowed him to see all aspects of life. He says the KMT's big comeback in Kaohsiung is a result of city residents projecting a kind of “generational anxiety”, accumulated over time as the city transforms. Polls before the election showed Han Kuo-yu's support base in the 40-49 age range, beating Chen Chi-mai for support in this age group. "Why? Because my generations feels a sense of pride in being from Kaohsiung. 20 years ago, Kaohsiung City could even compete with Taipei City to host the Asian Games. There's a strong local resident movement, some strong cultural momentum, and there's even three local newspapers here”, says Chen. Back then, Kaohsiung really was Taiwan's "second city". "But now? You say you want to compare us with Taipei, but compare what exactly? If you talk about these things you'll only get laughed at. It's obvious that the pride in being from Kaohsiung is gone.” Witnessing the glory days of Kaohsiung, it's only natural that one would feel depressed by the current situation. Chen thinks most people in their 40s feel this way. That disappointment isn't simply the core belief of the older generation, young people also bear the trauma of the city's "de-industrialization". The most obvious change is in income. Compared with Taiwan's other five metropolises—Taipei, New Taipei, Taichung, Taoyuan and Tainan—the average income in Kaohsiung is low. Making ends meet with a small salary is a problem faced by many residents in their 20s and 30s. Many feel that Han’s critique that the city is "too old and too poor" hits right on the mark. Chen describes the discourse and policies of the DPP as following an elitist trend. That's put Han's common touch into sharp contrast, with the Han Kuo-yu Wave exhibiting a kind of "anti-political" and "anti-elitist" tendency. The phenomenon isn’t unlike the 2016 US election, where a frustrated working class felt as if their problems weren't addressed by the ruling class. As for the Han Kuoyu Wave that has swept across the country, Chen believes his explosive popularity is a result of people releasing the feelings they had bottled up inside, and have found a means of expression through Han. This isn’t limited to Kaohsiung, in other cities and counties, there are hopes that their own version of Han will appear. "To be specific, it seems Han's candidacy has stirred up a long unsettled feeling within society. Han's appearance is a reminder to those in power that they need to have a broad understanding of each social class, and try break away from politics-as-usual." Chen also notes that patience has grown thin with politicians, and it will be difficult for one party in Kaohsiung to hold a monopoly on power in the future. In the long run, however, it's hard to say whether the emergence of Han Kuo-yu is a good thing or a bad thing. Han Kuo-yu supporters in Kaohsiung. Photo by Lin You-en. The bald supporter: "He speaks like regular people"
"Han Kuo-yu is like Chiang Ching-kuo (蔣經國), or more like a good emperor who is diligent and loves the common people", says Li Jen-chieh (李仁傑), who hails from Kaohsiung's Yancheng district. Dressed in the ROC flag, and with a cartoon sticker of Han Kuo-yu pasted to his wide forehead, Li is one of 277 bald men recruited to become "bald volunteer soldiers" by the Han Kuo-yu campaign. 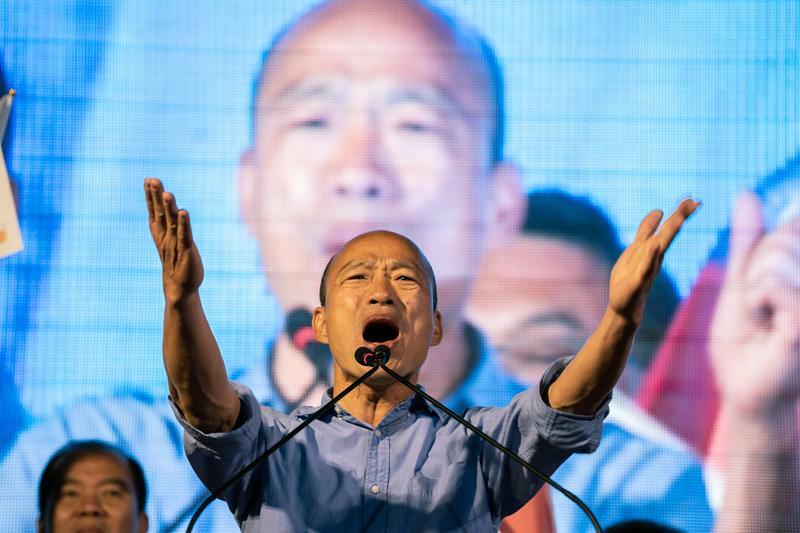 As the blue camp's final campaign event gets under way in Kaohsiung, Li is brought on stage with hundreds of other bald men to show their support for Han. Li hasn't voted for more than 20 years. But this time, in order to be a part of the campaign that's so captivated his heart, he's taken the day off from his job in Taipei, and booked a ticket on the high-speed rail just to appear on stage in Kaohsiung, and witness this momentous change; it's as if Lin and Han are sweethearts, yearning to be reunited. "It's simple, Han Kuoyu is pragmatic.” He then begins to repeat Han's campaign slogan, "if you have things to sell, and bring in people to buy, then Kaohsiung will benefit big time" (東西賣出去，人潮帶進來，高雄自然發大財). Han's slogan points to the diminishing returns on Taiwanese agricultural exports and the decreasing number of Chinese tour groups to the city. Although Han is a member of the KMT, and past candidates have pointed to the DPP's refusal to accept the 1992 Consensus, Han's slogan only tacitly points to the DPP's position on cross-strait economic and political relations. Li works in the tourism industry, and without Chinese tourists, related industries that depend on group tours have also done poorly. He says that if there's more Chinese tourists, everyone will be earning thousands of dollars more, which is better than nothing. Han's campaign slogan is simple enough even for a child to remember it. At Yong'an harbour, we meet an elderly fisherman who mentions the slogan too. "If the people come to buy, and you have things to sell, then Kaohsiung will benefit big time! Even my grandson is able to jingle the phrase out. Meanwhile, Chen Chi-mai said something about A.I. or computer intelligence or whatever, I can't understand that!" This election, the typical personas Kaohsiung residents associate with KMT and DPP candidates, have been swapped. Han Kuo-yu, with his grassroots speaking style, is butting heads with Chen Chi-mai, the refined and well-spoken candidate. The Trade union head: "I worry that he doesn't understand Kaohsiung"
Even Chen Chi-mai's campaign aides confide privately that Han Kuoyu, a second generation Mainlander raised in a military dependents' village, is quite different from the elitist KMT politicians of the past. Unlike KMT royalty like Sean Lien (連勝文) and Ma Ying-jeou, Han does not come from a prominent family and did not study abroad. After his work as a legislator came to an end in the early 2000s, he decided not to continue on in politics. He went on to become general manager of the Taipei Agricultural Products Marketing Corporation—an organization jointly owned by Taipei City and the Council of Agriculture. Han says this experience helped him to speak in a way that regular people could understand, a tone that fits the demeanour of Kaohsiung people. Chiang Chien-hsing (江健興), deputy director of the Kaohsiung City Federation of Trade Unions, says the last two years under the DPP has been hard to swallow, with retired public servants and teachers seeing their pension cut, an unpopular labour reform bill, and the decision to eliminate seven of Taiwan's public holidays. Supporting a candidate like Han, with his simple campaign slogan and a folksy way of speaking, has become the best channel to express how they feel. But Chiang is worried that Han did not propose a specific labor policy, and did not seem to fully understand Kaohsiung during the mayoral TV debate. It may take a long time for him to become familiar with the city, says Chiang. Indeed, many labour groups are wondering, is fixing Kaohsiung's economy as easy as he says it is? Han Kuo-yu went from looking like a long-shot, to causing a country-wide storm, to winning the election. Now, he's about to enter Kaohsiung city hall, gaining even more attention. For Kaohsiung residents eager to see change, Han's arrival is a welcome next stage for the city's development. But whether the media buzz translates into a continued support base for Han is yet to be seen. More English reads, please click here.